This December we're teaming up with Southern Hospitality’s Hip Hop Karaoke to through London’s biggest Hip-hop House party! You can expect 3 floors of the best bumper thumping hip-hop, and booty bouncing bangers from classic rap to modern trap, and current R&B floor fillers as we open up the whole of Queen of Hoxton for a night celebrating hip hops past, present and future! On the ground floor, residents Dj Odin (Rizzle Kicks) will be supplying a History of hip-hop over the evening, playing the biggest hits from across the years, starting things off with the funk and soul samples that made the music and going all the way through to the present day! In the basement, London’s Original Hip Hop Karaoke to take over giving everyone the opportunity to discover what it’s like busting out some Busta, or to drop it like it’s hot. Whether you want to go classic with some Biggie, Missy or The Fugees or keep it right now with Drake, Kendrick Lamar or Kanye, this is your chance to live out your rap fantasies to London's most loving crowd and share a stage with R&B royalty aka DJ Rob Pursey, Host Bobby Champagne Jr. and the extended Hip Hop Karaoke family. In room 2, Gin & Juices Dj Elwood will be proving the noise, playing a danceable mix of funk, soul & Disco that’s been sampled the whole way through hiphop history. 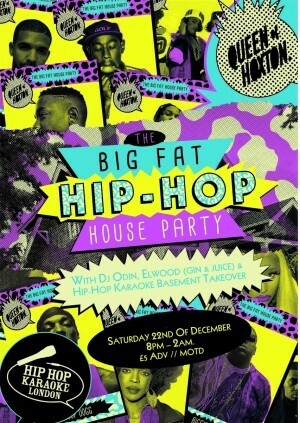 This is the closest we normal folk will get to live it up like the real hip hop big players, with a house party across one of East London's most iconic venues, spread across 3 floors! So don your furs, dust off your cane and let's start popping bottles!